Winter sleeping bags are simply puffy cocoons you can climb into for a good night’s sleep in temperatures of 20°F or below. They have several features similar to a three season bag such as zipper draft tubes, draft collars, and cinch-able hoods, but they also include extra insulation to get you through those chilly evenings. You’ll find a variety of styles available, so it is important to know what features you want in the best winter sleeping bags. The temperature rating tells you what the lowest temperature is that you’ll be able to stay warm at while in the sleeping bag. For example, if a winter sleeping bag is rated as a “20-degree bag,” it will keep you comfortable as long as the temperature doesn’t fall below 20°F. Everyone’s metabolism is different, and ratings can vary among the different manufacturers. 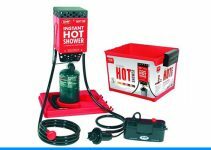 Use the temperature rating as a guide rather than a guarantee. The following are typical ratings. You will want to pick a winter sleeping bag with a rating that is slightly lower than what you are expecting to encounter. 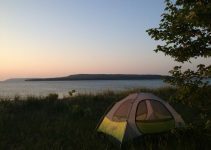 If the temperatures on your camping trip are expected to be close to freezing, choose one that is rated for 20°F rather than 35°F. You can always vent your bag to cool it down if temperatures rise. Winter sleeping bags work by trapping air next to your body. This air is warmed with your own body heat. The smaller the space is in your bag, the quicker it will heat up and stay warm. The shape often determines how much room there is inside a bag. There are four basic shapes to pick from. 1. 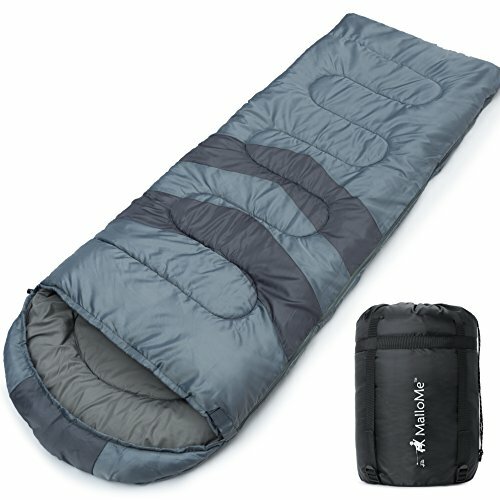 Rectangular: This is the most common shape for sleeping bags, and it provides the most comfort and room. 2. Semi-rectangular: The tapered design provides more warmth than a rectangular bag while still offering plenty of room inside for comfort. 3. Mummy: These bags include narrow shoulder and hip widths to maximize warmth. They are more restrictive, so it may be less comfortable. 4. Double Wide: This type of bag will allow two people to comfortably sleep inside. 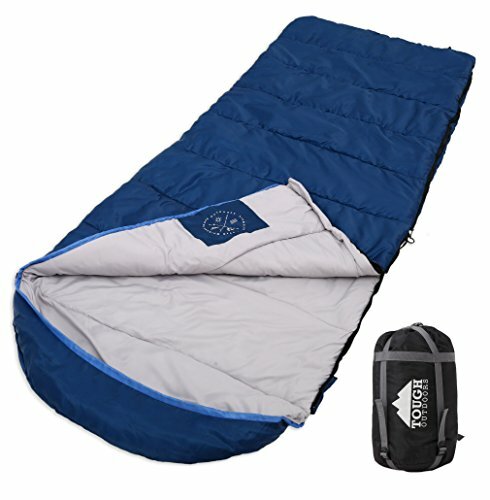 Most can be separated into two individual sleeping bags as well. Most people purchase winter sleeping bags with synthetic insulation due to its affordability, durability, non-allergenic features, and the fact that it dries quickly. The down side of synthetic insulation is that it won’t compress as small as other options when not in use. Goose down insulation will compress smaller and will be more durable, but this is reflected in the price. Keep in mind that down loses all of its insulation properties once it gets wet. 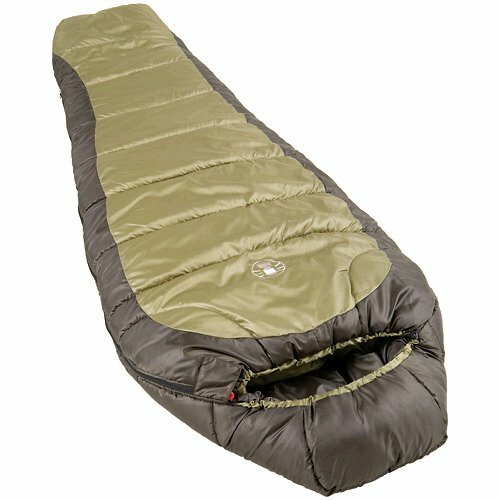 Women’s winter sleeping bags are design to match a female’s contours. They are generally narrower at the shoulders and shorter in length than a standard bag. They are also wider through the hips and have additional insulation for the upper body and feet. Kid’s sleeping bags will have special features like a built in sleeve to hold the sleeping pad or their pillow. This keeps everything in place for them so they can sleep more comfortably. They may also include pockets for MP3 players, headlamps, and other comforting items. Polyester or rip-stop nylon are the typical materials used for the outer shell of a winter sleeping bag. It is common for synthetic filled bags to have a shell that is also treated with a water repellent finish. This will allow any water to simply bead up rather than soak through. In contrast, the lining is designed to disperse body moisture. You can lose a lot of body heat through your head. A hood built into the sleeping bag can be pulled over you and cinched with a draw string cord. This prevents that heat from escaping. These handy pockets are ideal for keeping watches, MP3 players, and eye glasses close by. You will discover that some winter sleeping bags will have a special pocket underneath that you can slip your sleeping pad into. This prevents you from rolling off the pad while asleep. Pillow pockets allow you to use a special camping pillow, or even your favorite one from home, while inside of your sleeping bag. To save space, use this pocket to hold your clothing. This will then become your pillow, and you’ll have less to carry. A Stuff Sacks can either be included in your winter sleeping bag purchase or sold separately. They make it easier for you to transport your bag. They are sold according to volume in liters as well as their length and width. Cotton storage sacks can prolong the life of your sleeping bag, and they allow you to hang them up easily in a garage or storage area without crushing them into a stuff sack. Once the bag’s fill is permanently compressed, it will lose its insulation qualities. Liners are slipped inside of the sleeping bag to keep it clean and reduce wear and tear. Using a liner can also add 8°F to 15°F of warmth to the bag. 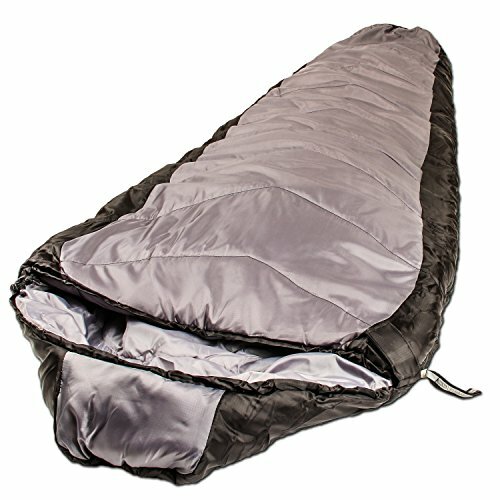 This winter sleeping bag from Hyke & Byke will save you space along with being lightweight to carry. The goose down insulation combined with a waterproof fabric provides you with plenty of warmth by trapping body heat in. The mummy shape includes a large footbox and wide shoulders for added comfort. Included in your purchase is the compression stuff sack and ripstop nylon fabric liner. Other features like YKK zippers, snag free Velcro, and vertical baffles provide durability. It comes in both long (3.1 pounds) and regular (2.87 pounds) lengths. 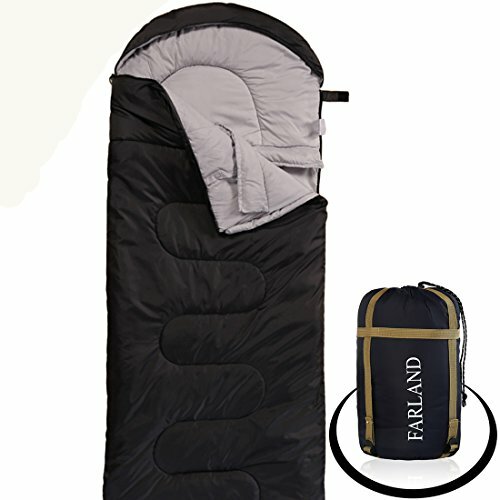 The Farland Camping Sleeping Bag is designed for a relaxing night’s sleep after a day of hiking. Folding is quick and easy with Roll Control so you can hit the trails early the next morning. It provides warmth in temperatures between 20° and 62°F, and the weather resistant, waterproof materials prevent you from getting damp. The mummy shape is 33.5 by 86.6 inches while comfortably fitting anyone up to 5 feet 11 inches in height. A breathable fabric is used in the liner’s construction while a waterproof nylon outer cover conceals the polyester Pongee filling. 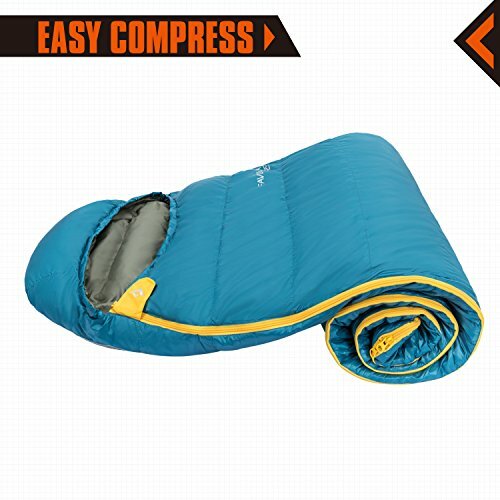 This winter sleeping bag is designed for temperatures ranging from 0° to 10°F. The mummy style bag is constructed with a 100% polyester ripstop shell and 100% polyester fill. Once inside, the semi-sculpted hood pulls tight with a drawstring to keep warmth in for anyone up to 6 feet 2 inches in height. Features such as an insulated footbox, a quilted construction, and a Thermolock draft tube provide further protection against the cold winter air, and you’ll find it is easy to use with the unique two way ZipPlow system that plows the fabric out of the way in order to prevent snagging. 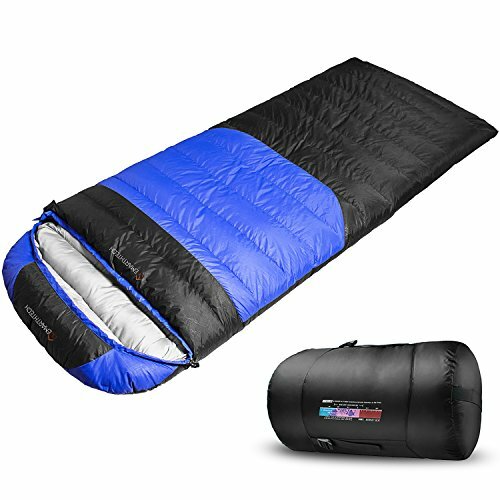 With a shell made out of 320T nylon ripstop fabric and 100% polyester fill, this winter sleeping bag from Emarth will keep you warm in temperatures as low as -20°F. The double layer construction includes 4.1 pounds of warmth trapping fill. At 90 inches long and a width of 35 inches, this bag can accommodate several sizes of people. The semi sculpted, drawstring hood and down-filled draft collar will trap your body heat in for additional warmth. When not in use, it folds easily to fit in its compression stuff sack, and if it gets dirty, it is completely machine washable. This winter sleeping bag will keep you warm even in damp conditions. The weather resistant, waterproof design keeps you warm in temperatures that drop to freezing, and the double layer technology, S-shaped stitching, and hexagon shape further add to its warmth. You can machine wash or simply spot clean this bag by wiping with a damp cloth. When not in use, it fits compactly into the compression sack that comes with it. This makes it easy to carry or store. The 100% polyester materials used in construction provides durability as well as making it lightweight to carry. 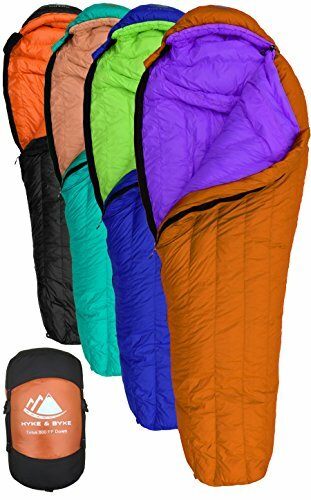 This multi-season sleeping bag includes comfortable features like a mummy style, half circle drawstring hood and zipper draft tubes that keep the cold air out. It measures 90 by 39 inches and weighs seven pounds. Although a bit heavy to carry, it does have a durable taffeta shell along with a double layer construction that includes a cozy poly-flannel lining. It is rated for temperatures as low as 0°F and has both right and left handed zippers so you are able to zip two together easily. Special features like the internal pocket for small items make this ideal for camping. This extreme weather sleeping bag includes many warm features like a half circle mummy style hood and zipper draft tubes. It measures 90 by 36 inches and has a packing weight of 9.5 pounds. The strudy ripstop shell withstands years of use while the dual layer, offset stitching prevents cold spots. The interior feels like your bedding at home with a brushed poly-flannel lining. Use it on its own or zipped together with a second bag. 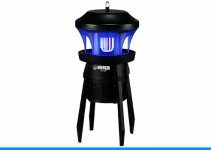 It is rated for temperatures as low as -25°F, and it comes with a limited lifetime warranty. 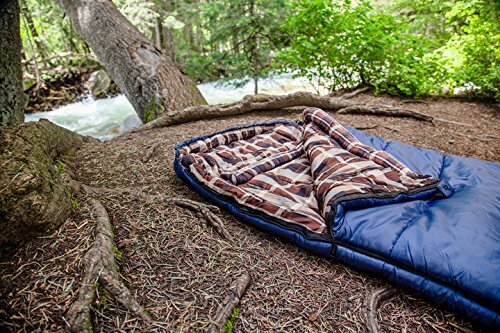 With a temperature rating of 32 to 60°F, this all season sleeping bag provides wonderful comfort while camping. The ripstop waterproof shell provides durability while the high-loft insulation offers warmth. The woven liner is soft rather than scratchy, and the ample size measuring 88 by 34 inches accommodates those up to six foot six inches in height. It is machine washable, comes with a compression sack, and folds down to 15 by 8 by 8 inches. An inner storage pocket is ideal for keeping track of your phone, keys, and other small items. Measuring 86 by 36 by 24 inches, this oversized mummy style sleeping bag will keep you warm down to -15°F. It fits big and tall sizes comfortably, and the triple layer construction provides maximum loft while still being able to compress down for travel or hiking. It is filled with a synthetic hydrophobic silicone material, has a full length, jumbo two way zipper, and an advanced thermal barrier. Rip stop polyester is used to create the shell, and features such as a drawstring chest baffle, a zipper draft tube, and an adjustable hood closer ad to the warmth. This winter sleeping bag is lightweight at only three pounds, and it can be compressed to 12.6 by 7.1 by 7.1 inches when not in use. Duck down is used as the filling that keeps you warm down to temperatures of 26°F while waterproof 50D polyester fabrics keep you dry. A thermo collar and half circle drawstring hood help to further keep the warm air inside. A polyester oxford compression sack is included in your purchase, and an inside pocket gives you a place for small items like a watch, wallet or flashlight. It also comes with a two way YKK zipper for added convenience. I'm Derek, owner of TopTenSelect.com. I'm a father of 6 and live in Rapid City, South Dakota USA. I love reviewing products and showcasing the very best in my top 10 lists. I want to enable people to buy products with confidence by reading up on the stuff they want to avoid the stuff they don't want. Top Ten Select Copyright © 2019. All requests to review a product, advertise with us, or media inquiries, please visit our Contact Page to send us a message. Toptenselect.com is a participant in the Amazon Services LLC Associates Program, an affiliate advertising program designed to provide a means for sites to earn advertising fees by advertising and linking to Amazon.com. Amazon and the Amazon logo are trademarks of Amazon.com, Inc. or its affiliates.